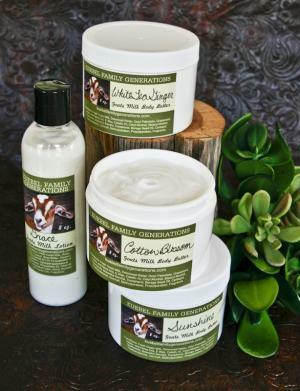 Lochte Feed & General Store is a proud vendor of Kuebel Family Generations Goat Milk Products. A local family owned business, Kuebel Family Generations produces high quality Goat Milk products like balms, butters, lotions and soaps. These products are made with blended fresh squeezed goats milk with germall and a premium butter base equal to the higher priced named brand butters sold elsewhere. The butters are made in small batches with a good dose of wholesome milk in each jar. The Premium Body Butter offers unmatched quality and price. The Unscented Body Butter is great for people with fragrance allergies. Support this locally owned business and get your body care needs at Lochte Feed & General Store. This entry was posted on Sunday, May 15th, 2016 at 12:54 pm	and is filed under News & Updates. You can follow any responses to this entry through the RSS 2.0 feed. Both comments and pings are currently closed.